Although the origin of rope is unknown, the Egyptians were the first people to develop special tools to make rope. Egyptian rope dates back to 4000 to 3500 B.C. and was generally made of water reed fibers. Other Egyptian rope was made from the fibers of date palms, flax, grass, papyrus, leather, or camel hair. The use of such ropes pulled by thousands of slaves allowed the Egyptians to move the heavy stones required to build the pyramids. By about 2800 B.C. , rope made of hemp fibers was in use in China. Rope and the craft of rope making spread throughout Asia, India, and Europe over the next several thousand years. By the fourth century, rope making in India had become so specialized that some makers produced rope intended only for use with elephants. Leonardo da Vinci (1452-1519) drew sketches of a concept for a ropemaking machine, and by the late 1700s several working machines had been built and patented. Rope continued to be made from natural fibers until the 1950s when synthetic materials such as nylon became popular. Despite the changes in materials and technology, rope making today remains little changed since the time of the ancient Egyptians. Synthetic fibers include nylon, polyester, polypropylene and aramid. Polypropylene costs the least, floats on water, and does not stretch appreciably. For these reasons it makes a good water ski tow rope. Nylon is moderately expensive, fairly strong, and has quite a bit of stretch. It makes a good mooring and docking line for boats because of its ability to give slightly, yet hold. Aramid is the strongest, but is also very expensive. Nylon and polyester may be spun into fibers about 4-10 inches (10-25 cm) long. Ropes made from spun synthetic fibers feel fuzzy and are not as strong as ropes made from long, continuous filaments. Some ropes use two different synthetic materials to achieve a combination of high strength and low cost or high strength and smooth surface finish. of yarns per strand, and the number of strands or braids in the finished rope. 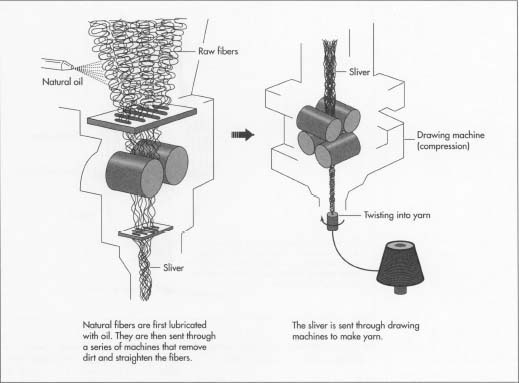 1 If the rope is to be made from raw natural fibers, the fibers are first lubricated with a natural oil. They are then fed into a series of machines that remove any dirt, straighten the fibers, spread them apart, and comb them with several sets of steel-toothed combs. Each set of combs has the teeth set closer together as the fibers proceed through the process. This produces a loose, continuous ribbon of fibers called a sliver. The fibers in the sliver have been aligned along the long axis of the ribbon. Synthetic fibers follow a similar process, but tend to align more easily. 2 The sliver is run through the rollers of a drawing machine to compress it before it is twisted into yarn. Yarn that has a right-hand twist (to the right and up) when viewed from the end is said to have a "Z" twist, and yarn that has a left-handed twist (to the left and up) is said to have an "S" twist. Sometimes this is referred to as right-hand laid yarn and left-hand laid yarn. The finished yarn is wound on spools called bobbins. At this point, the yarn may be dyed various colors to produce a strand, or an entire rope, of a particular color. This is especially helpful in finding a specific line in a maze of rigging on a sailboat. 3 The bobbins of yarn are set on a frame known as a creel. For three-strand, right-hand twist rope, Z-twist yarns would be used to make each strand. The ends of the yarns are fed through a hole in a register plate which keeps the yarns in the proper relation to each other. The ends of the yarns are then fed into a compression tube. As the yarn is pulled through the compression tube, the tube twists it in the S-twist direction, opposite of the yarn twist, to produce a tight strand. 4 The strands are either transferred to strand bobbins or fed directly into the closing machine. For common three-strand rope, three S-twist strands would be used. The closing machine holds the strands firmly with a tube-like clamp called a laying top. The end of each strand is then passed through a rotating die which twists the strands in the Z-twist direction, locking them together. This process is called closing the rope. 5 The finished rope is wound onto a reel. 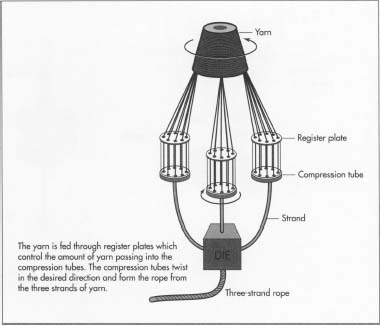 When the end of the strands has been reached, the finished coil of rope is removed from the reel and tied together with bands of smaller rope. The ends are either taped or, if the rope is a synthetic material, melted with heat to prevent them from unraveling. 6 Braided ropes are commonly made from synthetic materials. The bobbins of yarn are set up on several moving pendants on a braiding machine. Each pendant travels in an oscillating pattern, weaving the yarn into a tight braid. A set of rollers pulls the braid through a guide to lock, or set, the braid and keep tension on the rope. In some machines the braiding process is accomplished by feeding the yarns through separate counter-rotating register plates. One yarn is woven in one direction followed by another in the opposite direction, and so on, to form an interlocked braid. 7 If a double-braided rope is being formed, the first braid becomes the core, and the second braid is immediately woven on top of it to form the outer covering, called the coat. 8 As the rope emerges from the rollers, it is taken up on a reel. The finished coil is then removed and banded, and the ends are taped or melted. 9 Eight-plaited rope consists of four S-twist strands and four Z-twist strands. The strands are paired together with one S-twist and one Z-twist in each pair. These pairs are then held together and braided with the other pairs. The manufacturing process first follows the twisted rope process to make the strands, then the braided rope process to form the final rope. The level of quality control depends on the intended use of the rope. Ropes intended for general purpose use are sold by diameter and tensile strength. Tensile strength is determined by breaking a sample piece under load. Basic raw material specification and a visual inspection are the only quality control measures used for these ropes. Ropes intended for high-risk applications—such as rappelling, rescue work, and lifting objects over people—are more closely inspected and tested. These ropes have a finite service life and may also have a color code or other coding to indicate the date of manufacture. Some ropes incorporate some type of wear tracer formed into the rope. These tracers are usually a single yarn of contrasting color placed just under the outer wrap of yarn. Should any abrasion or overextension of the rope occur, this filament would be exposed, indicating an unsafe condition and requiring that the rope be replaced. Merry, Barbara. The Splicing Handbook. International Marine, 1987. Foster, G.P. "New Fiber Rope Technologies Drive Increased Applications." Sea Technology, July 1989, pp. 15-16.